The Pelion Peanut Pole is located in the small town of Pelion, just 22 miles southwest of Columbia. Pelion is also home to the annual South Carolina Peanut Party, a two-day festival that celebrates the history of boiled peanuts — the official state snack of South Carolina. The South Carolina Peanut Party attracts legume lovers from all over the state and includes carnival rides, live entertainment, a PB&J sandwich-eating contest, and more. 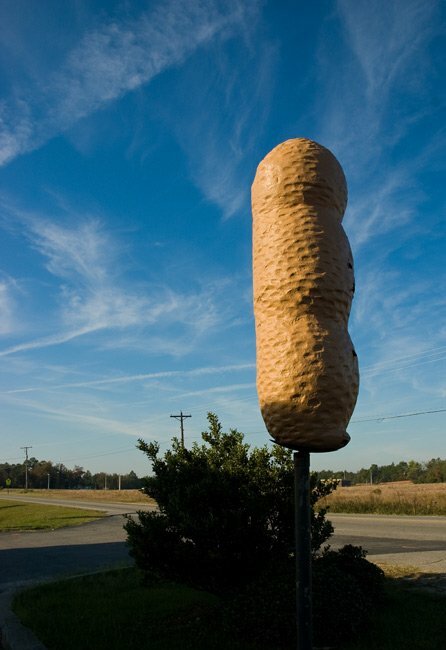 Pelion farmers have been producing and harvesting peanuts for over 100 years, so its only fitting that this giant, cast-iron peanut serve as the town’s welcome sign! Sounds fun! We are not directly affiliated with Pelion but would love to see you participate in the parade. Your best bet is to contact the town directly. Their phone number is (803) 894-3535. Thanks! I am the director of SC Smash, women’s tackle football team. We are a non-profit organization and we would like to participate in your upcoming parade. Whom can I contact? I can be reached at (803)979-1782.